In late July the Society was approached by filmmakers interested in using the prison as the location for their movie. The Nevada Department of Corrections asked the Society to supervise this project and provided us with a letter of authorization. What followed was five weeks of hard work by our attorney, Brian Hutchins, resulting in a location agreement between the filmmakers and the Society. This detailed agreement will guide our involvement in the current project and also serve as a model for future television and movie projects at NSP. Our small volunteer organization is taking on some big challenges, challenges that require intimate knowledge of Nevada law and policy. Without Brian we could not do this. Huge thanks to Brian! Preparation for filming consumed the month of September. Filming will begin soon and continue through the first week of November. The Society currently has 27 volunteers who are fully approved for any assignment at NSP; 20 are actively involved with the supervision of this project. The society will be receiving a donation for its involvement. We are also benefiting from the extensive work the filmmakers are doing to restore and clean areas throughout the old and new sections of NSP. We are being very careful to protect this historic property from modifications that would change or alter its original look. Glen Whorton has been consulting with the State Historic Preservation Office when necessary. Our architect is finishing the analysis that will determine the improvements necessary to conduct regular public tours at NSP. Glen Whorton has reported that there will be three major projects to satisfy the code requirements: 1) Handrail on the sidewalk from the North Wing to the Cellhouse; 2) Removal of a non-historic wall between A and B Block; and 3) A handicap ramp to the middle door of the Cellhouse. Glen has been working with our architect and our state agency partners on a regular basis. Most recently he has reached a consensus on using modular aluminum ramps for the approaches that require access ramps. All of this preliminary work will culminate when the change-of-use application is submitted to the State Public Works Board. There is definitely light at the end of the tunnel. Society board member Lee Perks is assisting Glen with the mechanical and engineering aspects of these and other projects. As many of you know, Lee has spent a career managing large construction projects. 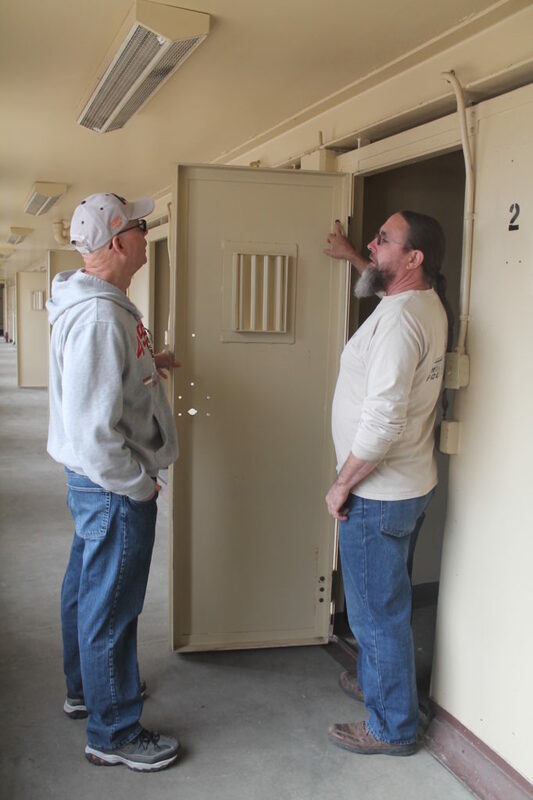 Board member Maurice White, right, shows Jim Benedetti the work he did to rehang a door on an isolation cell in C-Block. Board member Maurice White recently finished a project to re-hang three of the heavy metal doors on the isolation cells in C-Block. When these cells were in use, and the outer doors were in place, the effect was a form of solitary confinement. The doors were removed at some point when this type of confinement was deemed too harsh. The Society believes it is important to accurately represent the conditions that actually existed at various times in the history of NSP, thus the restoration of the doors. This project required that Maurice use his machine shop skills to fabricate a workable mounting mechanism, the doors were painted at a Prison Industries shop, and Society member Joe Kinsley assisted Maurice throughout this project. The State Historic Preservation Office approved the project. Maurice will be writing an article about this project for a future newsletter.